HomestayKorea ::: FAQ - For Guest - How do I apply for homestay? How do I apply for homestay? First you must create an account on our site. Simply click the "Sign up" button in red next to the login section and fill in the required information. Please copy your User ID and password for your reference. Once you have successfully registered as a member of our site, the next step would be to apply for homestay as a guest. To do this, click on the couch icon at the top of the site (labeled homestay) and then click on the tab labeled "New Application" (located on the left side of the site) and fill out the information and submit. Congratulations! You are now applied as a guest! After completing your application, you can search for hosts and send them your application. 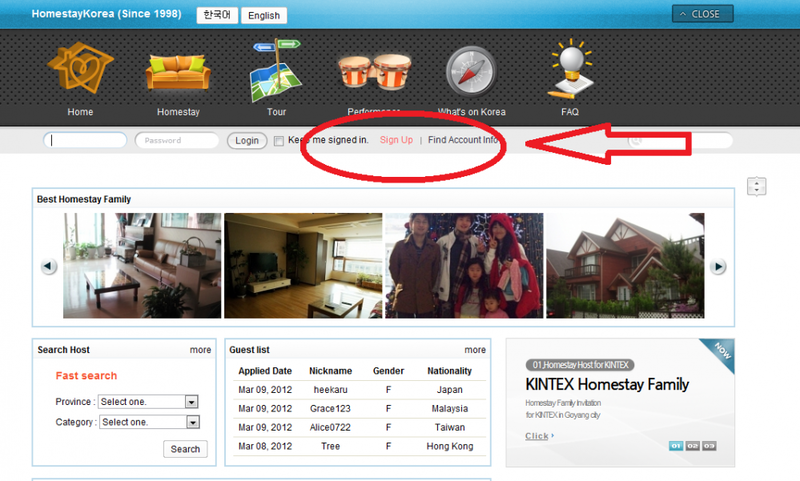 Hosts can also see your application and invite you for homestay if they desire. Homestay Application How do I apply for homestay?